Various start dates throughout the year. The minimum duration for this apprenticeship is 24 months. Have two GCSEs at grade C/4 or above including English and maths. Be employed within the catering industry or have an employer in this area willing to take you on as an apprentice. 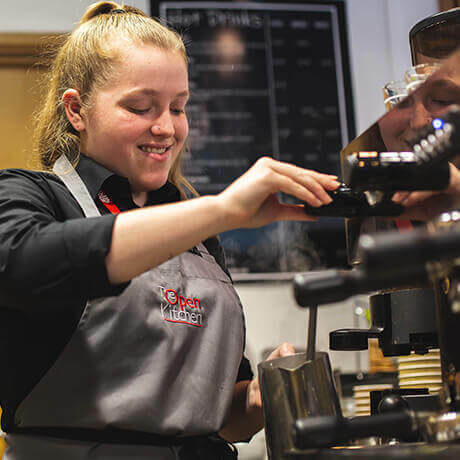 This Apprenticeship provides the skills and knowledge required to provide vital support to management teams and be capable of independently supervising hospitality services. Hospitality supervisors work across a wide variety of businesses including bars, restaurants, cafes, conference centres, banqueting venues, hotels or contract caterers. They typically work under pressure, delivering fantastic customer service and motivating a team. Supervisors may specialise in specific functions of work across a wide variety of functions which reflect the multi-functional nature of the industry. E-portfolio and workplace observation. Guided learner hours are delivered during contracted working hours. On completion of this pathway, you may progress onto further qualifications specific to their work context or into employment.